Originally published by the Westminster Assembly of Divines in 1646, the Westminster Standards are a thoughtful and detailed summary of the Biblical and unchanging Christian faith which God caused to flourish again in the 16th and 17th Centuries. These have also been adopted as the doctrinal basis for the James Begg Society. We are pleased to make available the Westminster Standards as free PDF downloads, and as MP3 audio filed read by Paul Hayden. If you have a mouse with more than one button, right-click n the link and then select "Save as...."
The text and proof texts found in this edition of the Shorter Catechism are the original ones submitted by the Westminster Assembly to the English Parliament in 1648; only the spellings have been updated. The proof texts are given here in full. In other published editions some of the proof texts have been partly or entirely ommitted, substituted by other references or had other references added to them. This edition of the Shorter Catechism is also available for purchase as a pocket-sized booklet from the James Begg Society. This small but spiritually weighty directory is usually included with the Westminster Standards, although it was produced and officially adopted by the General Assembly of the Church of Scotland in 1647. This was this same 1647 Scottish Assembly which officially adopted the products of the Westminster Assembly (1643-47) — namely, the Confession of Faith, Shorter and Larger Catechism, Form of Presbyterian Church-Government and the Directory for the Public Worship of God. It wasn't an oversight of the Westminster Assembly that they didn't produce a directory for family worship. Their purpose, according to their sworn covenant, was to "bring the Churches of God in the three kingdoms [of Scotland, England and Ireland] to the nearest conjunction and uniformity in religion, confession of faith, form of church-government, directory for [these three Churches' public] worship and catechising" (Solemn League and Covenant, Article 1). That is, the purpose of the Westminster Assembly was to develop a common doctrinal confession and church order for the established churches of the three kingdoms, which later became the United Kingdom. To issue directions for the worship of God in households was not part of their purpose. 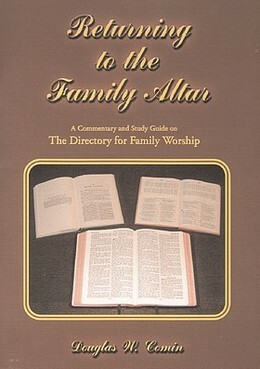 Rev Douglas W. Comin has produced a commentary and study guide on the Directory for Family Worship, called Returning to the Family Altar. This has been published by the James Begg Society.